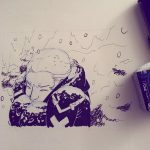 Posted on November 17, 2018 November 18, 2018 by Abrian CLeave a Comment on That’s a Wrap on the Woolmancy Campaign! We wrapped up last night, having raised just over $5,000! Orders will begin as soon as all of the funds transfer (about 2 weeks). 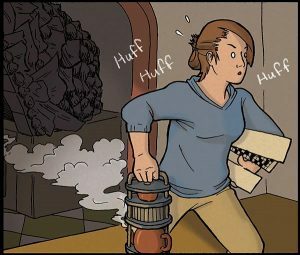 In the meantime, I’m finishing up the bonus comics for the campaign, tidying up all the fluff left over on the web and settling in to my downtime schedule before preparing for my next convention in December, then shipping out the books as I get them in! 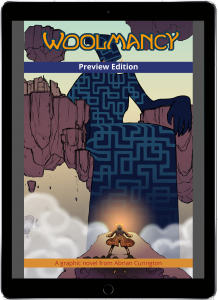 We are in the final hours of the Woolmancy pre-order campaign and I could not be more pleased at how everyone around me reached out to those around them, spreading and growing to fund the first print run of Woolmancy! 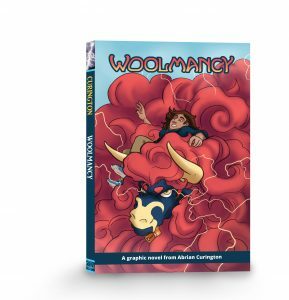 24 Hours Left in the Woolmancy Pre-Order! Posted on November 15, 2018 by Abrian CLeave a Comment on 24 Hours Left in the Woolmancy Pre-Order! As of this moment, on the night of Nov 15th, you’ve raised over $5,200! 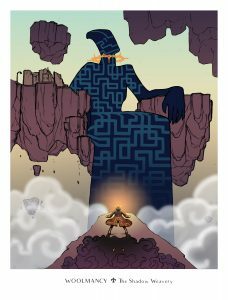 You’ve unlocked a reprint of Bellmage, last year’s graphic novel. You’ve unlocked the entire PDF of my first graphic novel that started it all, literally available nowhere else but here. And my Gumroad store, but good luck finding THAT. You even raised Style Quest from the dead… it’s getting a reprint! And when I say you, I really mean you, even if you haven’t backed the Kickstarter. You see, you’ve been around. You’ve come to look at my work. You’ve shown even the smallest amount of interest. And that speaks VOLUMES to an artist. Posted on October 16, 2018 by Abrian CLeave a Comment on The Woolmancy Kickstarter is LIVE! The time has come friends! 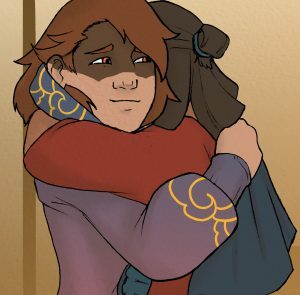 Whether you’ve been on this journey with me from the beginning, or you just found out about some crazy comic with lightning sheep yesterday, I am so thankful for you. Your delight in this project is the reason why it was created in the first place. Head on over to the pre-order page and see what you’ve helped to create! Posted on October 14, 2018 by Abrian CLeave a Comment on 2 Days Left!! – Don’t know? Look it up! Day 2 in our 10 day countdown to the Woolmancy pre-order Kickstarter, launching on October 16th, 2018! 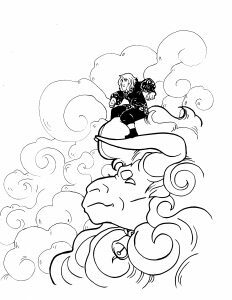 To kick this launch off, I wanted to count down 10 kooky things you didn’t know or realize about Woolmancy. 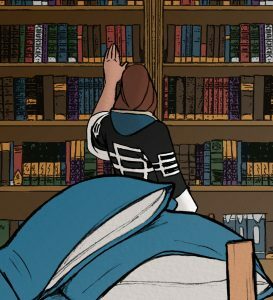 I love libraries and books (which is why I insist on offering a print copy of my comics), therefore my characters are equally fond of research in order to find answers. At one point, we get to see one of the rooms of the weavery’s grand library. You can imagine that this was not my most favorite thing to paint! Nonetheless, ’twas important to me that it be included! Day 3 in our 10 day countdown to the Woolmancy pre-order Kickstarter, launching on October 16th, 2018! To kick this launch off, I wanted to count down 10 kooky things you didn’t know or realize about Woolmancy. Fact #3 – There’s no romance! Woolmancy is about a best-friend break up. It’s right there in the tagline of the book. It’s an exploration of trust, loyalty, hurt and forgiveness. And frankly, why does everyone have to get together in the end? Sure, it tidies things up neatly in some circumstances, but I also think it’s really nice when friends just get to be friends! 4 Days Left – Animals are Important! Posted on October 12, 2018 October 13, 2018 by Abrian CLeave a Comment on 4 Days Left – Animals are Important! Day 4 in our 10 day countdown to the Woolmancy pre-order Kickstarter, launching on October 16th, 2018! To kick this launch off, I wanted to count down 10 kooky things you didn’t know or realize about Woolmancy. Because of the magical current running under Kanvala, some animals have the ability to live among humans and interact in a way that is understandable to us. No, they don’t speak “human.” That’s just silly! Day 5 in our 10 day countdown to the Woolmancy pre-order Kickstarter, launching on October 16th, 2018! 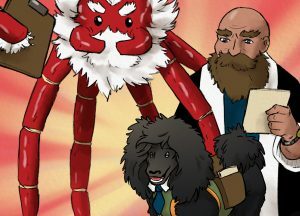 To kick this launch off, I wanted to count down 10 kooky things you didn’t know or realize about Woolmancy. Not only did I draw the opening sequence to Woolmancy three separate times within one year, I went through about 8 full drafts of detailed story synopsis before hitting upon the final script. For at least half of those scripts, Woolmancy was a murder mystery. But don’t worry, no one actually died. 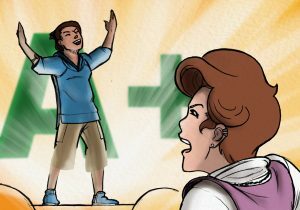 Mirin went to get the fleece at the beginning of the story to win a bet, and the effects of it drove her a little crazy. But, from the beginning, her pal Satski dragged her out of the crazy. It’s still a good story, just muddier than the final draft. I must say though, I do miss that kitchen sequence from the second try at the opening. Mirin’s tea set is the coolest tower thing. Still drawing up plans to make one. Day 6 in our 10 day countdown to the Woolmancy pre-order Kickstarter, launching on October 16th, 2018! To kick this launch off, I wanted to count down 10 kooky things you didn’t know or realize about Woolmancy. It’s true, though it doesn’t seem like it. When you start with a limited (and this is a pretty wide set of colors, let’s be honest, but any expansions were blended from the base colors) color palette, you can vary the final appearance of them by overlaying one of the other colors in the palette on top in an interesting way. Some people just choose to stick to the limited palette without mixing and I someday want to try a full project this way, but I still haven’t made the leap! 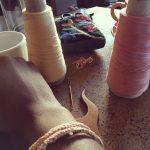 New to the Woolmancy project? It’s my new graphic novel about a best-friend breakup in a land of magical weavers and lightning sheep!